Some sponsors of North Carolina's HB2 and the governor who signed it into law received outside campaign support from national super PACs backed by companies opposing the measure. Clockwise from top left: primary sponsor Rep. Bob Steinburg, Gov. Pat McCrory, and co-sponsors Reps. Jonathan Jordan, Michele Presnell, Michael Speciale, and Harry Warren. Since the hurried passage of North Carolina's HB2 last month in a special legislative session, numerous businesses have publicly spoken out against the law, which bars transgender individuals from using public bathrooms that correspond to their gender identity and blocks local governments from enacting their own nondiscrimination and minimum wage ordinances. But many of these same businesses funded two outside political groups that helped elect five of the bill's sponsors, 13 other legislators who voted for it, and McCrory, who immediately signed the measure into law. Outside groups are unaffiliated with campaigns and are not allowed to coordinate with candidates. At least 36 companies that have come out against HB2 so far have given a combined $10.8 million to those Washington, D.C.-based groups, the Republican State Leadership Committee (RSLC) and the Republican Governors Association (RGA), in recent election cycles. Companies that have criticized HB2 have donated over $4.3 million to the RSLC since the 2010 election cycle. * They include Citigroup (nearly $893,000), Pfizer (over $654,000), Google (nearly $312,000), Bank of America (over $239,000), Dow Chemical (nearly $221,000), Facebook (nearly $165,000), and SAS Institute (nearly $152,000). PayPal, which contributed $399 to the RSLC in that period, has announced that it is canceling plans to open a global operations center in Charlotte in protest of the law. In the 2010 cycle, the RSLC was by far the biggest donor to a North Carolina-based super PAC called Real Jobs N.C., contributing at least $1.25 million. Real Jobs then spent over $1.5 million on 19 North Carolina House and Senate races. Republicans backed by Real Jobs won in 16 of those contests, taking these offices for the first time and ousting incumbent Democrats. Most are still members of the N.C. General Assembly, and 11 of them voted for HB2. Real Jobs spent almost $110,000 in that cycle supporting Rep. Harry Warren, a Rowan County Republican, and over $65,000 benefiting Rep. Jonathan Jordan, a Republican representing Ashe and Watauga counties. Warren and Jordan co-sponsored HB2. In the 2012 cycle, RSLC contributed $300,000 to Real Jobs, which in turn spent nearly $885,000 backing Republican candidates in North Carolina, with almost half of that going to support McCrory. Real Jobs helped 11 Republicans win open seats, retain seats, or take out a Democratic incumbent. All remain in the General Assembly, and nine voted for HB2. In the 2012 election cycle, the RGA contributed $338,000 to Real Jobs and also spent over $4.9 million directly on ads benefiting McCrory. 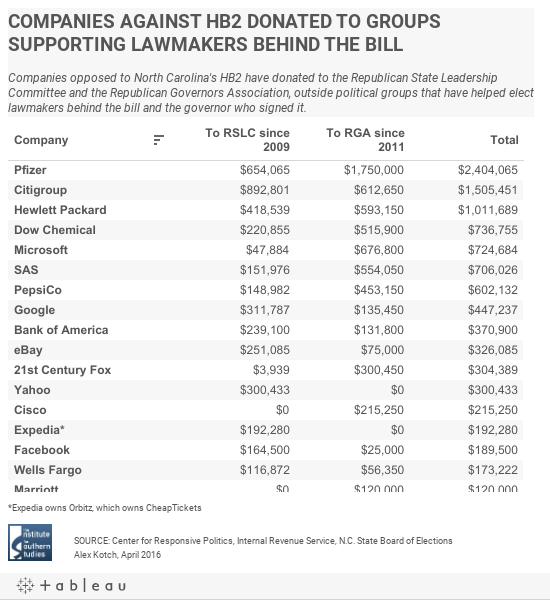 Companies that have criticized HB2 have donated nearly $6.5 million to the RGA since the 2012 election cycle. * They include Pfizer ($1.75 million), Microsoft (nearly $677,000), SAS Institute (over $554,000), Dow Chemical (nearly $516,000), PepsiCo (over $453,000), Cisco (over $215,000), Marriott ($120,000), and American Airlines (almost $27,000). Many of these same companies also donated to the RSLC. It remains to be seen how the RSLC will direct money into North Carolina state elections this year, but the RGA has already reserved $4 million in TV time supporting McCrory's re-election bid and launched a six-figure web campaign against his Democratic challenger, Attorney General Roy Cooper. Cooper says he will not defend the state in a legal challenge to HB2, which he called "a national embarrassment" that "will set North Carolina's economy back if we don't repeal it." * The figures are drawn from the Center for Responsive Politics, the N.C. State Board of Elections and the Internal Revenue Service.